You open Journey Builder by pausing your mouse pointer on the Journey Builder category on the app switcher and then clicking Journey Builder on the menu that appears. When the app appears, the dashboard is the first screen that you see. You can get back to this screen by clicking Journeys in the gray toolbar at the top of the screen. That toolbar also contains Entry Sources and History options. The Entry Sources option is a legacy feature; you don’t need to click that option. The History option, on the other hand, is particularly useful considering some of Marketing Cloud’s most recent changes. Title: The first column contains the name of the journey, the current version number, and the description if you added one when you made the journey. Click the name to open the journey. Running: The journey is available for subscribers to enter. Draft: The journey is still available for you to edit. Subscribers can’t enter a journey with this status. Finishing: The journey was previously running but now is no longer available for subscribers to enter. Subscribers already in the journey are flowing through to activity completion. Stopped: The journey was previously running but now is no longer available to subscribers. The activities in the journey have stopped. Total Entries: The third column displays the number of contact records that have entered the current version of the journey. Goal Attainment: The fourth column displays the percentage of contacts that have met the goal criteria for the journey, if you have a target goal set. Last Modified: The final column shows the date and time that the journey was last modified. You can sort the journeys in the list by the values in any of the columns. Click the column header to sort the list by that value. Tag: Use this button to associate your journey with an existing campaign or add new keyword descriptors. You must select the check box next to one or more journey names before you can click this button. Filter: By default, the right side of the dashboard is the Analytics section. You can click the funnel icon that appears above the Analytics section to change it to the Filters section. On this part of the screen, you can search for a particular journey by name, filter the list of journeys by status, or filter them by tags. Click the pie chart icon above the Filters section to return to the Analytics section. This part of the screen shows which journeys are achieving their goals. It also lists which journeys are the highest and lowest performing against their goal targets. 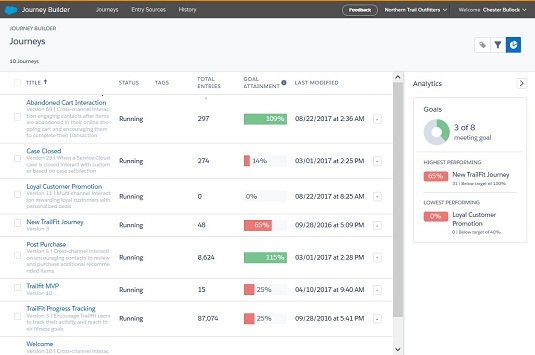 The dashboard with the Filters panel enabled. 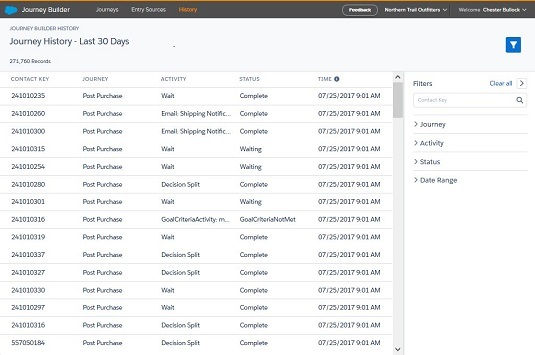 The Journey Builder History menu maintains all the journey-related activity for the last 30 days. Every time a subscriber completes a step, receives an email, or exits a journey, a row appears in the History menu. Because the History menu records every step in every journey for every subscriber, the history can contain an exceptional amount of data. Your history might have millions or tens of millions of actions. To view the history, click History in the top navigation bar. The records in the history appear. Note the panel on the right side of the screen, where you can search for the records for a particular subscriber or filter the records based on other criteria. 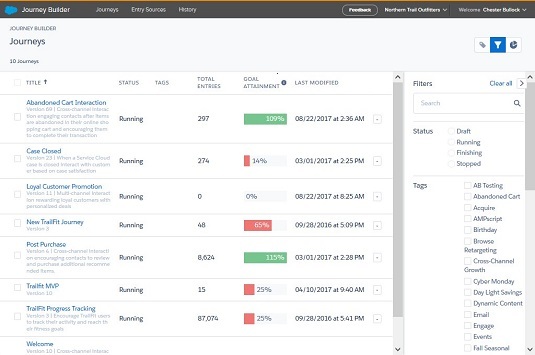 The Journey Builder History menu, with the search/filter panel on the right. The first field of the search/filter panel lets you search by contact key, which is an email address for most accounts. If you search for a particular email address in this field, you can see exactly where the subscriber is in a journey and what steps he or she has completed in the last 30 days. For a particular journey: If you choose this option, you can further filter by the versions of the journey. Related to a particular kind of activity: Examples include wait step, decision split, or email send. Within a particular date range: You can choose 12 hours, 24 hours, 7 days, 30 days, or a custom range within the last 30 days. Search by email address and configure filters to limit the results. Journey Builder does not include a feature to export history data. However, you may have success highlighting the rows on the History screen and then copying and pasting them in a spreadsheet program, such as Microsoft Excel.